The Noida authority has several plans for infrastructural development on this stretch of Noida, according to the new master plan; the recently approved Metro alignment will be developed to link Noida with Greater Noida, and later on at the Yamuna Expressway. The Noida authority has a plan to build a 3.9 km Metro line between Kalindi Kunj and the Botanical Garden crossing through Noida Expressway. The authorities are also planning to provide Ganga water to the residents of this area. In terms of infrastructure, the authority plans to develop a road network of over 20 km, sewage treatment plants with a total capacity of 30,000 kilolitres per day, 126MW captive power generator. According to the new master plan, 70 per cent of the total area along the Noida and Greater Noida will be kept for green spaces. 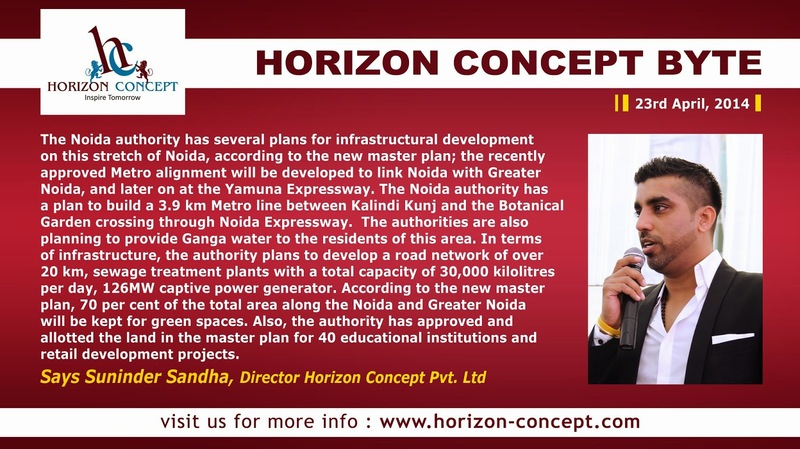 Also, the authority has approved and allotted the land in the master plan for 40 educational institutions and retail development projects Suninder Sandha, Director Horizon Concept Pvt. Ltd..